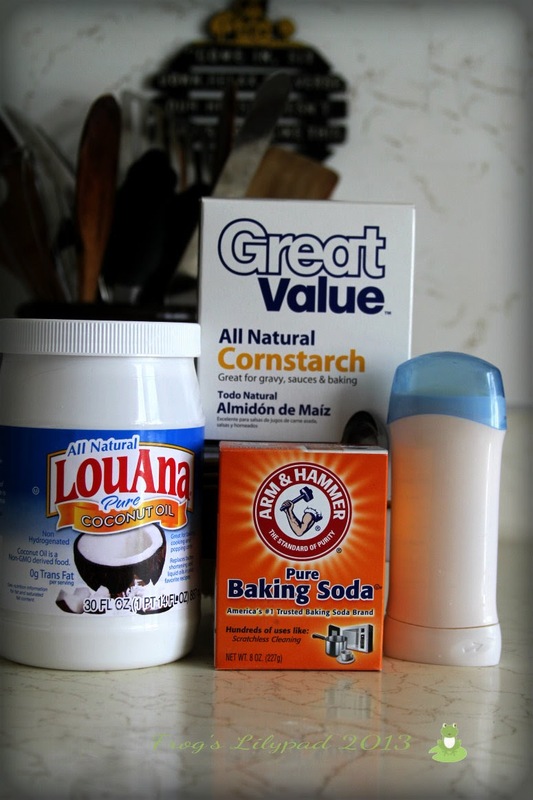 For several years, I have been seeing the words HOMEMADE DEODORANT on the internet. The first time I read about making deodorant myself, it was in an article about the chemicals in store bought and how they are used to keep you from sweating and the links to cancer and aluminum. Well, if you're like me then you don't want to smell sweaty pits. :P BUT... sweating is a natural way for your body to cool itself and to expel toxins. I finally decided I would give homemade deodorant a try at the end of March. Let me tell you, I was a little worried about it not working; so worried, I carried my spare store bought container in my purse when we went to church the first Sunday I wore it. I even carried it with us to Oklahoma; I just wanted to make sure I was not going to stink. Both times, this simple homemade product worked. Use your imagination and pretend there is a bottle of Tea Tree Oil in this photo. Yep, I completely forgot to add it in the grouping. If you haven't been introduced to Tea Tree Oil yet, I'm introducing you to each other now. Tea Tree Oil is an amazing antiseptic and antifungal oil. It can be used for many things including shampoo and deodorant. I have not seen any "oily" stains in my shirts; and that's a good thing. I have a white tee shirt I only wear at home and I've not noticed any of the darkening that happens to white shirts. It doesn't take covering your whole underarm and down the side of your body (I know I'm not the only one who has done this in the past); just a couple of swipes in the pit. Also, I don't have to worry about white marks on my dark tops any longer. There are many recipes out there for homemade deodorant and I chose to use the TTO because, well because I like the smell and since it is an antifugal I figured, why not. I did cut down on the baking soda and go up on the cornstarch. I'm not sure if I would have any reactions to the baking soda, but there are reports of people breaking out because of it, so I decided to not use as much. I made this recipe without the beeswax when we lived in Montana. During the cooler weather, there was no problem with melting. But when the temperature rises above 75 degrees, the deodorant began to melt. I kept the container in the refrigerator until it was finished. Now that we have moved back to the steamy south, I add beeswax to my deodorant. In a small container heat the coconut oil and beeswax just until they are soft. Mix with the other ingredients until smooth. If you don't over heat the oil and beeswax, you should be able to pour the mixture into an old deodorant container. (roll it all the way down) If you do over heat it and it is a liquid, cool it down in the refrigerator until you can pour or scoop into the container. If you try making your own deodorant, I would love to hear about it. You can read more about odor and deodorant HERE, HERE, and HERE.